There appears to be agreement at the international level that those who employ chemical weapons should be punished. But in the Syrian case it has been clear that this does not equate to a guarantee of swift prosecution. In a new journal article, Brett Edwards and Mattia Cacciatori examine the emergence and politicization of the chemical weapon justice agenda. The chemical weapon norm has been repeatedly violated by parties in the Syrian civil war. The gross violation of such an internationally-sacrosanct norm would appear to provide clear impetus for collective action; including criminal justice. 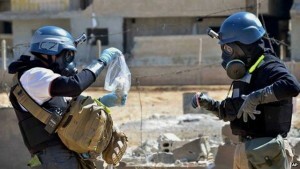 After all, chemical weapon issues have received heightened attention as compared to other war-crimes. Chemical weapon atrocities are also subject to a comparatively well-developed set of international instruments. Yet, the diplomatic discourse on this matter has been particularistic and impotent. Most recently, a specially developed attribution mechanism (the Joint Investigative Mechanism) became the victim of disagreements, which had dogged the initiative since its inception. This leaves us currently, in a situation which borders on farce: all sides agree that chemical weapon attacks have continued to take place; all sides agree punishment is important; and all sides are apparently eager to take action on this issue. Yet collective action between all major powers against impunity, even on this narrow issue, seems a bridge too far. It is clear, that the apparent deadlock on the issue of chemical weapon justice, centres at one level on a situation in which veto powers in the UN Security Council have committed to differing accounts of who is behind chemical weapon use in Syria. Whether this reflects a genuinely-held consensus on the issue within intelligence communities and in the higher echelons of government is beyond the scope of our analysis. It is also clear that selective outrage has been the norm, in the context of a broader bloody and vicious civil war. In our paper we argue there is a need to take into account more than cynical patronage alone to understand the politics surrounding this issue. Analysis needs to go beyond narrowly construed strategic conceptions of the drivers of public diplomacy. That is to say, while it is clear that quests for justice have undoubtedly been made sub-servient to other state interests during the conflict, as well as broader struggles to define the international order, justice as a value and a concept still matters in diplomacy; and has helped define the scope of the politically desirable and possible in this area. This is in the sense that justice has informed decision making in both national and international forums. In laying out our argument, we point to areas of agreement, disagreement as well as practical initiatives particularly in areas such as war-crime documentation, multilateral attribution processes and prosecution. Our study is presented as a historical case-study as part of an attempt to point to key contingencies, moments, path-dependencies and re-current patterns of behaviour. Our central argument is that there have been substantive disagreements between states on the issue of justice, which reflect broader positions on transitional justice. However, justice initiatives are tightly intertwined with other drives and interests of states. This has contributed to a situation in which where has been a partial stalling of the justice agenda in relation to chemical weapons. However progress toward ensuring some form of accountability on the issue was made through a number of distinct formal international mechanisms and through civil-society evidence collection, curation and archive systems during the period studied. Our findings helps contextualise events in Spring 2017, which led to U.S. airstrikes against the Syrian regime. They help us understand the structures of the disagreements within the UNSC and OPCW in particular, which have served to motivate, but also curtail initiatives to ensure accountability for those who employ chemical weapons. Including the work of the Joint Investigative Mechanism (which was terminated in the context of a split UNSC at the end of 2017), work under the auspices of the UN Independent International Commission of Inquiry on the Syrian Arab Republic, the OPCW Fact Finding Mission; the International, Impartial and Independent Mechanism on International Crimes Committed in the Syrian Arab Republic as well as the recently established International Partnership Against Impunity for the Use of Chemical Weapons. Brett Edwards is a lecturer in security and public policy at the University of Bath. Mattia Cacciatori is a lecturer in conflict and security at the University of Bath. They are authors of “The politics of international chemical weapon justice: The case of Syria, 2011–2017”, Contemporary Security Policy, forthcoming. It is available here.